Okay, so this is not an original idea. 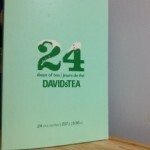 I was in David’s Tea today and picked up one of their 24 Days of Tea Advent Calendar. 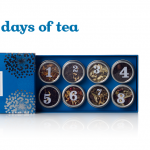 It’s a great idea for an early Christmas gift for the tea lover in your life. They also had an 8 Days of Tea for Hanukka. Unfortunately both are no longer available online, and the 24 Days isn’t even listed anymore. BUT you can easily create your own, and one that you can use over and over again each year. Find either a tea storage box or small wooden storage drawers in the appropriate number of days. For example, this 8 section bamboo tea storage box or this 25 drawer box . Decorate your calendar in the appropriate theme using paint, paper and stickers . For the tea caddy, you can cover each section with felt or foam that gets removed on the day. Make sure to number each section or drawer. Fill each drawer or section with a different tea. You can buy a tea sampler or, if you’re like me, you could fill it with tea from your own cabinet. Voilà! 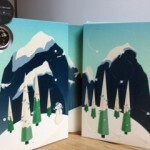 You have a holiday tea calendar that you can use every year.